'David Perry, director of global education for Trend Micro Inc., who also noted that the concept of a computer virus was first described in the 1975 science fiction novel, The Shockwave Rider, by John Brunner. 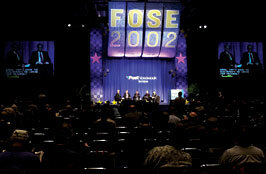 'Bill Diamond, CRM evangelist for PeopleSoft Inc.
Panel discussions at FOSE covered topics from security to customer relationship management. Right: the Government Keynote Panel'with speakers from the CIO, CFO, Procurement Executives and Human Resources Management councils'kicks off one of the sessions. This year's Azimuth awards for outstanding service to federal IT went to Treasury CIO James Flyzik, at top left, flanked by OMB's Mark Forman and FOSE general manager Bill Howell, and IBM Corp. executive Anne K. Altman, top right. 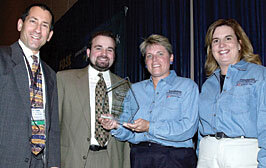 From left: Thomas R. Temin, Post Newsweek Tech Media vice president for editorial, and GCN Lab director John Breeden II present a Best New Technology at FOSE award to Jan O'Hara and Melissa Payton of Panasonic Personal Computer Solutions for the company's Mobile Data Wireless Display. 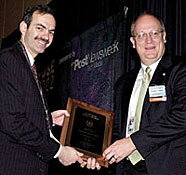 OMB's Mark Forman, left, presents one of the CIO Council's Showcase of Excellence awards to Navy deputy CIO David Wennergren. Among the keynote speakers during FOSE's three days of events were Adobe Systems Inc. CEO Bruce Chizen, far left, and Lockheed Martin Corp. chairman and CEO Vance Coffman. 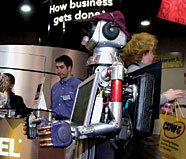 Direct Connect Dave, a robot at the Nextel Communications Inc. booth, greeted visitors with unsolicited comments. Agency decision-makers exchanged observations and experiences about systems policies, status of their major IT projects and their expectations for the future of federal IT. 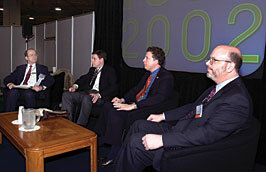 Above, left to right, NASA's David B. Nelson, OMB's Jonathan Womer, and Interior's Scott J. Cameron and John Mahoney talk about plans for the Interior Department's Recreation One-Stop project. 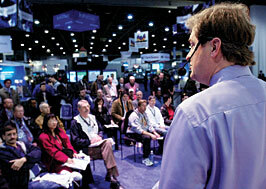 Attendees flocked to presentations on the FOSE floor, such as this one at the Intel Corp. booth.